‘Light and Shadow on Hollyhocks’ © J.Hart ’14 ink on paper. It has been an interesting experience for me to try to explain my ideas about climate change face to face in real life. Everyone to whom I have dared to speak, and by now I am discouraged enough to rarely bring it up in person, agrees that something is up with the climate, and that we are looking at major changes in the world; but then the response divides along two slightly different paths. The first is a complete refusal to even think in depth about what is happening; it is a kind of mental throwing up of one’s hands-a belief that nothing substantive can be done to change the situation, though not a denial that the situation is as bad as it appears. Most of my friends feel that they are doing all they can: composting, recycling, voting for the best politicians, buying less, reusing, demonstrating, posting on Facebook, and praying that someone or something will rescue us, and there the discussion ends. The second reaction is a concentrated effort to show me that I am clearly a pessimist who is catastrophizing a situation that may or may not happen in the near future, hence the encouragement to be happier and more positive-to see the glass as half full rather than half empty! This Panglossian attitude is usually bolstered by all sorts of data supporting the world view that we are living in a golden age: less crime, better health, less abject poverty (https://www.theguardian.com/commentisfree/2019/jan/29/bill-gates-davos-global-poverty-infographic-neoliberal). This view privileges data without understanding that data is neutral; it is only useful if the methodology creating it and the questions asked of it are unbiased. Depending how it is framed, data can be read in many different ways. There can be less one-on-one crime, and yet more violence worldwide as the heat and drought exacerbates war and famine and state supported crime. It is also based on two fundamentally flawed ideas: (1) that humanity can control Nature; and (2) that “progress”-the unending improvement and growth of the human condition, whether in wealth, longevity, safety, health-is a realistic goal for human existence. Both ideas are ahistorical and unnatural. The first comes from our Judeo-Christian heritage and has been enshrined the past three hundred years by the scientists, engineers, and merchants who brought us the Industrial Revolution, including the agricultural revolution of the past one hundred years. It suggests that we are not part of Nature; not under the rule of natural laws, but above them; able to understand, manipulate, and coerce the natural world to satisfy our needs in a way none of the “lower” animals can. Of course, we believe today that we have progressed so far technologically and scientifically that, at this point in history, we can avoid a collapse. Most of my friends and acquaintances, who use this argument, are convinced that, with the level of our science and with the interconnectivity that computers and the internet bring, our scientists, engineers, entrepreneurs, and inventors will, in very short order and in the manner of a deus ex machina, solve our ecological problems and save us from the mess we have created and continue to exacerbate! This belief is not to be found among the scientists who spend their time and efforts actually studying Nature. They have been figuratively screaming at the top of their lungs the warnings about the approaching disasters, but to no avail. (https://www.theguardian.com/environment/2018/dec/02/world-verge-climate-catastophe) The alienation from the natural world is very extreme in the Western urban “first world” where I spend most of my time; and the distance between the average person who has very little connection to Nature and the scientists who study all aspects of the natural world in great detail is alarmingly great! The image I have of the “optimists” who tout the status quo is that of people looking around, attempting to see reality, but, while doing so, holding mirrors up in front of their faces, so all they can see is their own reflections! 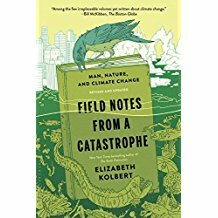 Given the choice, I prefer to believe the scientists who have studied Nature deeply and have a healthy respect for her power, complex systems, and physics, rather than the pundits and “optimists” whose reading on the subject is shallow and whose understanding is constrained to a one species world view! The second fallacy is a new idea, historically, but one that has proven to be particularly addictive and unnatural. It is embedded in the present dominant capitalist economic system; and it is the underlying assumption for much of what we do, as individuals, corporations, and nation states. In order to show progress, we must become wealthier, our lives must become better, our houses bigger, our lifestyles easier and more convenient, our pleasures more spectacular, our cars faster, our lives longer, and the list goes on and on! Any reduction in comfort, diminution of convenience, reduction in scale, or husbandry of resources is seen as a loss and a moving backwards! But Nature does not operate on “progress” much as we would like it to. The reality is that the natural world is regenerative. There is no waste in Nature; everything is related to every other thing, and every animal fits into its ecological niche, fulfilling a role that allows the whole system to operate efficiently and to maintain itself over very long geologic time periods. For us to use the resources available to us on Earth in a sustainable manner that would guarantee our future existence as a species, we would need to jettison much of what we are so proud of in our modern world: all the technological and worldly goods that have been created with the use of unsustainable resources and that have had to be trashed when they break and are unrepairable. So it is true: in one way I am a pessimist. I believe that only a few of us (the Amish, for instance) can revert to a natural and really normal lifestyle dependent on the work of our own hands and the fruits of our own agricultural labor. The rest of us, and I include myself, don’t have the courage or self-discipline to reduce our lifestyles to the level that is necessary to help the Earth. But Mother Nature will eventually force us to live closer to her, more in rhythm with her seasons and laws; unhappily, if we continue on our present path, the transition will be painful and traumatic. So, though I don’t subscribe to the “optimism” that clings to the present unsustainable economic system, at the same time, I am optimistic about our future: a simpler, slower, and more rustic future that we will be forced to make, but which will not be a loss but a improvement in our human community and condition. The present dark age with its extreme luxury built on the misery of exploited people, animals, and ecosystems will end, and I believe it will be replaced by a time of reduced material comforts but increased justice and peace. *Definition of Panglossian. : marked by the view that all is for the best in this best of possible worlds; from Pangloss, a character in Voltaire’s book Candide. It All Turns on Affection. Collapse: How Societies Choose to Fail or Succeed. Drawdown: The Most Comprehensive Plan ever Proposed to Reverse Global Warming. Willful Blindness: Why We Ignore the Obvious at Our Peril. Animal, Vegetable, Miracle: A Year of Food Life. Don’t Even Think About it: Why Our Brains Are Wired to Ignore Climate Change. The Hidden Half of Nature: The Microbial Roots of Life and Health. In Defense of Food: An Eater’s Manifesto. 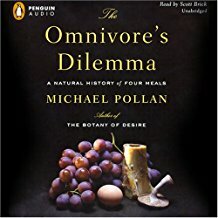 The Omnivore’s Dilemma: a Natural History of Four Meals. Folks, This Ain’t Normal: A Farmer’s Advice for Happier Chickens, Healthier People, and A Better World. The Black Swan: The Impact of the Highly Improbable. The Art of Simple Food.